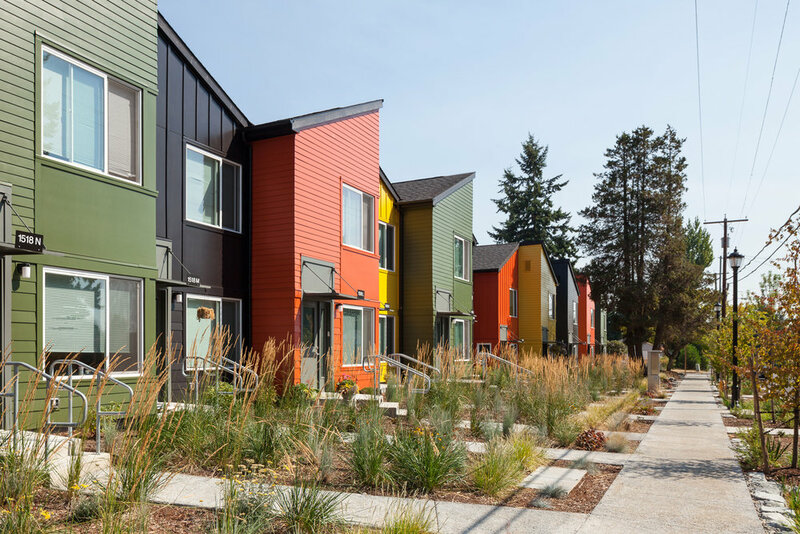 A vanguard project in the state for modular construction, Kirkland Avenue Modular (also known as Kirkland Avenue Townhomes / KAT) are the largest publicly funded affordable housing project in Washington to be built using modular construction. 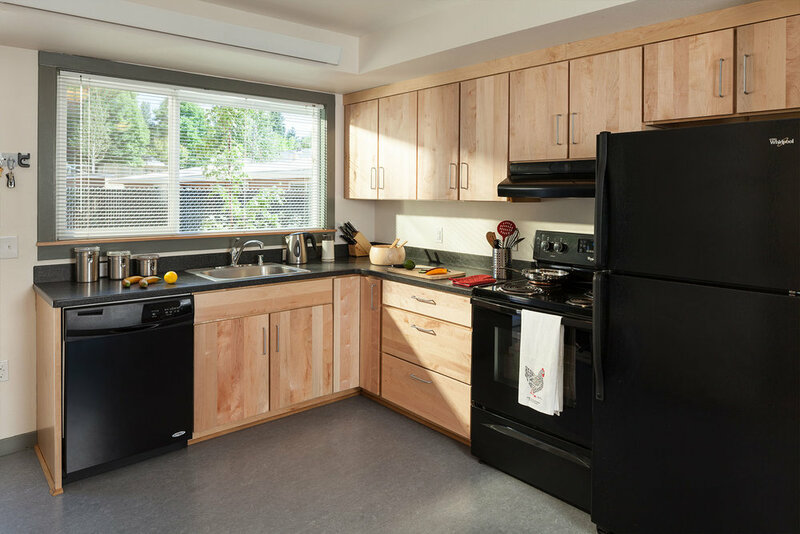 The project provides fourteen (14) 2-bedroom townhomes and four (4) 3-bedroom flats for low income families and veterans. The interior layout features an open plan for kitchen, living and dining – offering ample daylight and cross ventilation. The exterior design celebrates the modular construction by featuring a split gable at the 14’ module width. The townhomes are offset 4’ to create a contemporary interpretation of the archetypal house. The 2 story townhomes reinforces a pedestrian scale that will set a benchmark for new development in this post-war suburb. The buildings are nestled in amongst large mature trees making the project feel as if it’s been there a long time, but the fresh architectural design clearly marks that it’s a new development. The design is cost conscious but incorporates a high level of sustainable features. All stormwater is managed on site. Accessibility was a priority as well, with each unit being easily visit-able, and two units provided as fully accessible units. Working closely with civil engineers and landscape architects, innovative storm-water solutions were developed into attractive rain gardens and pervious paving as opposed to traditional below grade water detention vaults. These gardens will serve the functional requirements of storm-water retention, while providing additional landscaping at no additional cost. All building roof runoff is directed to bioretention swales and retention galleries under the pervious parking lot. Run off from public roadway which was previously untreated is cleaned in the bioretention swales. The bold but simple design is cost conscious and incorporates a high level of sustainable features; providing the residents with a home that is attractive, healthy for both the residents and planet, yet easy to maintain. 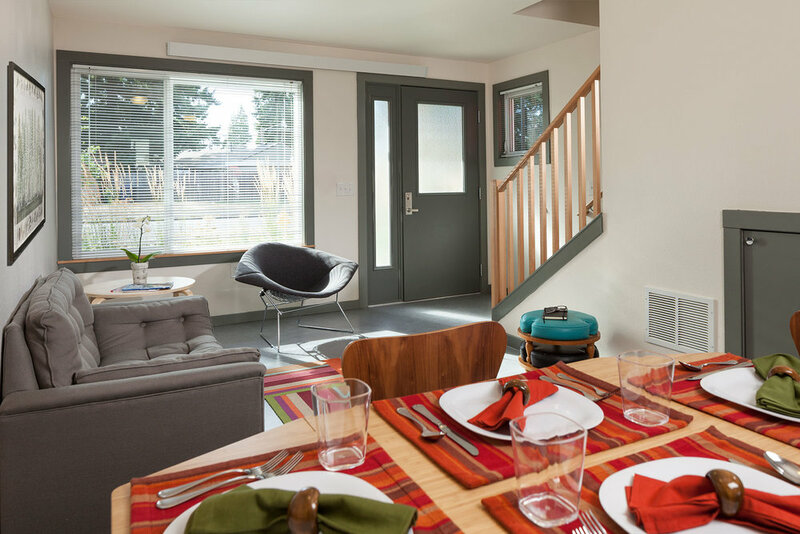 Nestled into a residential neighborhood, these modular, energy efficient homes are appropriately scaled to fit within the character and density of the neighborhood. The design was focused on creating equality for all tenants by providing similar daylighting and natural ventilation through its massing strategy. This allowed the heating and ventilation system to be simple electric cove heaters with a whole house exhaust fan – eliminating costly duct runs and expensive furnaces. The buying power of a national modular vendor allowed the client to purchase higher quality materials (which are ultimately more durable and will not require as frequent replacement) such as solid core doors, solid surface countertops, marmoleum flooring, and all plywood cabinet construction. While these materials didn’t cost the owner less money, they got a better quality product for the same money. And this will result in long term maintenance and operational savings. As a state funded project, this project satisfies the Evergreen Sustainable Development Standards – a Washington state green building rating system modeled after the Enterprise Green Communities standard. In addition, the state energy code is one of the most stringent in the nation. Both of these requirements result in homes that are highly energy efficient and provide a high level of resident comfort. The unit design incorporated ample windows that provide natural daylight on at least 2 sides of the main living spaces as well as some of the bedrooms. This allows residents to keep lights off for more hours during the day, especially in the summer months. The highly insulated walls, roofs and floors result in a temperature stable home year-round that does not require air conditioning and provides acoustic privacy from their neighbors as well as outside noise. No VOC sealants and finish materials were used throughout. All wood products are No Added Urea Formaldehyde (NAUF). Energy Star electrical fixtures and appliances were installed. All units individually metered for electricity. No fossil fuel heating – clean hydroelectric power source. Environmentally friendly flooring materials – marmoleum flooring, GreenSeal carpeting (allowed only in the bedrooms). Durable materials – solid surface countertops, solid plywood cabinet boxes, solid wood interior doors. No garbage disposals in units to encourage composting. Advanced framing (reduces required lumber). 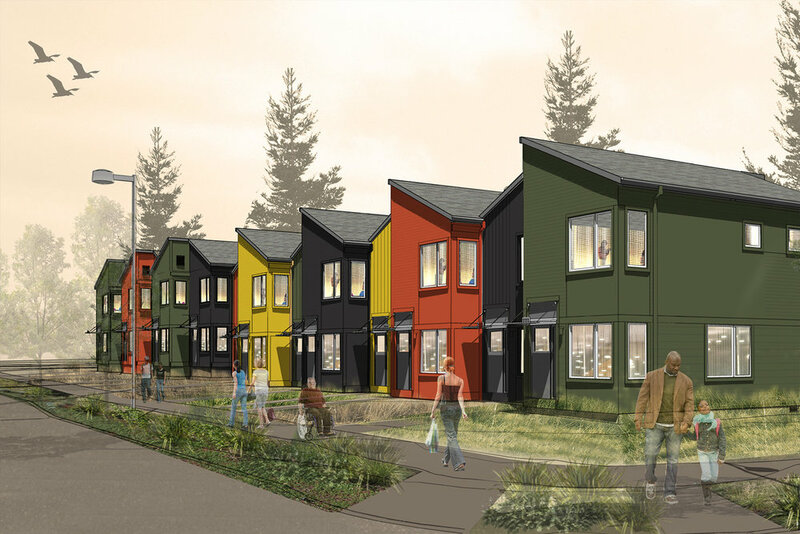 "renton awarded fourth smart communities award"
"regional news and congratulations on grand opening"
"these 18 low income housing units in Renton are modular construction"